Within an effort for providing a layered architecture of services supporting multi-peer collaborative applications, this paper proposes a new type of consistency management aimed for applications where a large number of processes share a large set of replicated objects. Many such applications, like peer-to-peer collaborative environments for training or entertaining purposes, platforms for distributed monitoring and tuning of networks, rely on a fast propagation of updates on objects, however they also require a notion of consistent state update. To cope with these requirements and also ensure scalability, we propose the cluster consistency model. We also propose a two-layered architecture for providing cluster consistency. This is a general architecture that can be applied on top of the standard Internet communication layers and offers a modular, layered set of services to the applications that need them. Further, we present a fault-tolerant protocol implementing causal cluster consistency with predictable reliability, running on top of decentralised probabilistic protocols supporting group communication. 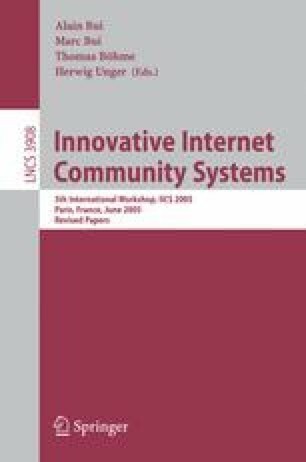 Our experimental study, conducted by implementing and evaluating the two-layered architecture on top of standard Internet transport services, shows that the approach scales well, imposes an even load on the system, and provides high-probability reliability guarantees.